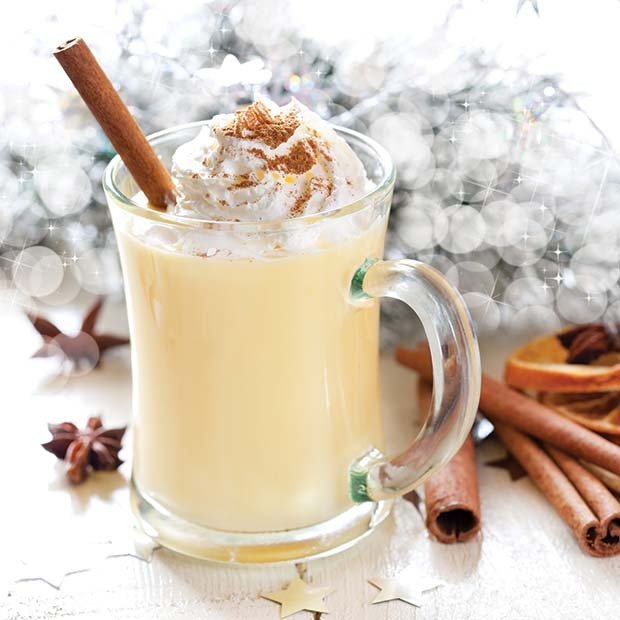 For a serving of eggnog (one cup), you will be consuming approximately 342 calories. Of those calories, 167 are from fat. The word eggnog comes from a Middle English term meaning a small, wooden, carved mug used to serve alcohol. Gelatin can be found in some eggnog, though it is typically cream, milk, sugar, eggs, cinnamon and nutmeg. Eggnog became popular in America around the 18th century when it made its way across the Atlantic Ocean, though there is debate exactly when and where it originated. It is difficult to find eggnog year round. It typically becomes available around Thanksgiving. Sales for eggnog drop tremendously after the New Year’s holiday. 1826 ‘Eggnog Riot’ at West Point military academy. When informed that their Christmas eggnog would be alcohol free, cadets in North Barrack No. 5 decided to make their own eggnog with alcohol, for a Christmas eve late night/early morning celebration. Of course it got noisy and they were caught. Shouting and general disorder developed, some swords were drawn, firewood crashed through windows, and at least one shot was fired. The artillery unit stationed at West Point had to be called in to quell the disturbance. In the aftermath 6 cadets resigned, 19 were court marshaled, and many, including a young Jefferson Davis, were confined to quarters for more than a month. 1914 John Muir died. Muir was a naturalist who was largely responsible for the establishment of Sequoia and Yosemite national parks in California in 1890. 1968 ‘I Heard It Through The Grapevine’ by Marvin Gaye is #1 on the charts. 2006 In the Chicago suburb of Villa Park, thieves stole a semi tractor trailer filled with broccoli. It was valued at $50,000.